I also did quite a lot of other activities. One thing that I enjoyed was hiking up one of Tuscany’s highest mountains; Monte Amiata. I was impressed and surprised by the amount of Beech and Chestnut trees that were present along my hikes. There were also some very interesting mushrooms along my paths. Birds that I have never seen before soared high above me, and I also spotted a deer and two fox that were sneaking around in the vegetation. The hike itself was fairly gentle most of the time, and the views were amazing. Another thing that I did while in Tuscany was paragliding. Right off the top of Monsummano Terme, I ran down the gentle slope until the very end, where I was able to catch the wind from a thermal updraft. Before I knew it, I was flying like a bird and gliding over the rolling terrain below me. The sky was a perfect blue, with not a cloud around. All was quite around me as I savored the moments I had in the air before shifting the paraglider and aiming for my landing spot. Oh, it was a peaceful, heart-stopping feeling, to have the wind floating me around and helping me to soar in mid-air. Tuscany also offered me a perfect place to enjoy a scenic helicopter ride. Once again, the view from the air is gorgeous. 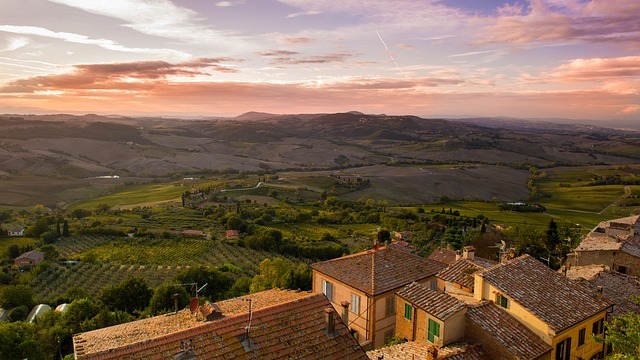 Tuscany has such gentle, rolling hills and wide expanses of vineyards and olive groves. It is just awesome. From the helicopter, everything below looks so simple and organized. Yes, Tuscany is a wonderful place to visit. If you are an adventure-seeker, like myself, or if you enjoy things that are more calming, then you will find it all in Tuscany. From the activities that I already mentioned, to rock climbing, dirt bike trekking, cave-exploring, and many other unique adventures, Tuscany has plenty from which to choose. I know that I will remember my travels there, for a lifetime.